In October, I had the privilege of serving in Romania with our WOC team. I have traveled many times to the Malnutrition Center in Guatemala and once to Uganda in 2016. Each trip is special and unique in its own way, Romania was no different. Each day was filled with big and small precious moments that I know were glorifying to God. I’m always amazed at how God beautifully knits a team together to fulfill the plans He has determined long before our feet ever touch the ground. We spent three mornings in a gypsy village ministering to the children. On the first morning, we walked through their community in an attempt to gather the children for a time of VBS. This was one of my favorite times of the trip as we walked down their streets, amongst their homes, in their community, as part of what is their everyday ordinary life. How sweet it was to have children we had never met before take our hands and eagerly walk with us to enjoy the festivities of the morning and to hear about our precious Jesus. These children may live in another country, but just like our own, they seek love and acceptance. As I looked through the lens of my camera I was able to see the love of Jesus in each team member as they loved on the children of Romania. Every smile, every hug, every minute poured into these children was glorifying to God. Sometimes it is easy to think that we need to go out there and do something extraordinary (which if that is what God is calling us to do then we are to obey), but He is just as glorified in the small everyday things that we all are capable of giving of ourselves. ”As I looked through the lens of my camera I was able to see the love of Jesus in each team member as they loved on the children of Romania. Every smile, every hug, every minute poured into these children was glorifying to God. We also spent three afternoons at an orphanage. It may have been a different group of children (and young adults), but one thing was consistent, they still seek love and acceptance. The teenage girls especially might have been a little more reluctant on day one to accept us, but by day three we were able to see God help break down barriers and gain some of their trust as we poured into them the love of Jesus. Each day we had a time of devotion with them, helped them learn how to cook, gave many smiles and much love. On day three, when we pampered them with manicures and pedicures and truly became the hands and feet of Jesus to them, we saw such a drastic change in them accepting us, that it was obvious that God was definitely paving the way. In three short days we went from four rather reluctant, hesitant girls to 11 on our last day. Before we left, they were anxious to show us their rooms, allowing us a brief glimpse into their personal lives. Several of the girls received Bibles that day. May God speak so clearly to them as they read and study His word that they will come to know His great love for them in their own personal lives. On our way back to Budapest we were able to make a brief stop in another gypsy village, and meet a girl that had received an operation funded by the body of Christ coming together to meet the needs of One More Child. We were able to see the results of the surgery and to see her not only standing but walking. As a team we were able to pray over her in such a sweet and simple way. God is most certainly glorified when the body of Christ comes together and sees others through His eyes and reaches out to meet their needs. I also had a very brief opportunity to meet my newest sponsored child. She is a sweet, very timid little girl. As you enjoy this most special time of year, celebrating the birth of our Savior, my prayer for each of you as we end the year 2017 and embark on 2018, is to look for ways to glorify God in the BIG and SMALL. Pray about joining us in 2018 for a day of service, a mission trip, sponsoring a child through the sponsorship program and attending our event in February. But just as importantly, look for ways in your everyday ordinary lives, to see the people around you through the eyes of Jesus and reach out and tangibly be a blessing to them. It might look different for each and every one of us, but we are ALL glorifying to our Heavenly Father. 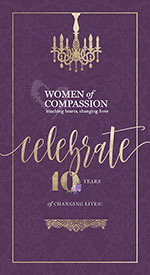 Women of Compassion 10 Year CELEBRATION!